Composting is an issue that Carleton students are very passionate about and as a result, the composting project has a long history . It started with an ENTS concentrator choosing the issue as his capstone project. He concluded that the best composting mechanism for campus would be an elaborate system of Earth Tub composting units. In the Fall of 2006, the SOPE Composting Task Force applied for the first phase of the EPA's P3: People, Prosperity, and the Planet Sustainability Competition. During the Summer of 2007, the students found out that they were granted the first award of $10,000 for a pilot project. Students returned to the 2007-08 school year ready to use the funds and propose a larger Phase II project. 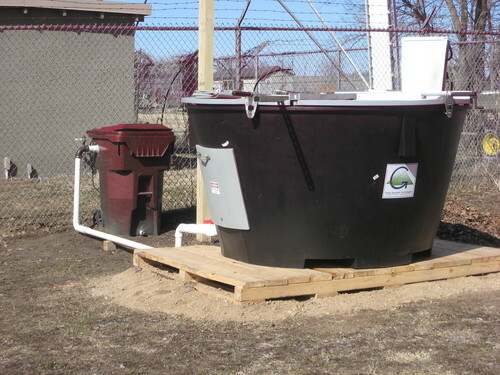 Since then, an initial Earth Tub has been installed on campus next to the water tower. It is an exciting development, not only because of its relation to the EPA Grant, but also because there is a demand for compost! Farm House residents maintain an organic garden where the compost could be used, and a separate group of students is working on establishing a Carleton Farm where even more compost can be applied. For the second phase of the EPA P3 competition, SOPE students have proposed installing more Earth Tubs throughout the Northfield Public School District. The Superintendent is excited about the project, and the task force will be competing for the grant in Washington D.C. in April.